Since its introduction in 1947 our lead product, OSPHO, has been ordered and reordered across many different institutions. It continues to prove its worth wherever corrosive conditions create problems — boats, refineries, arsenals, railroads, automobiles, etc. OSPHO is also handy for home maintenance for instance — gutters, fences, buildings, fire escapes, sash, and roofs — any metal surface. Visit our distributors page to find out where you can purchase to try it for yourself. 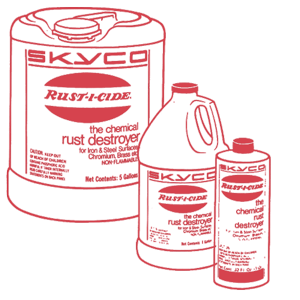 Is a trusted solution to remove rust and prepare metal surfaces for paint.